signal goes below -60dB of attenuation. 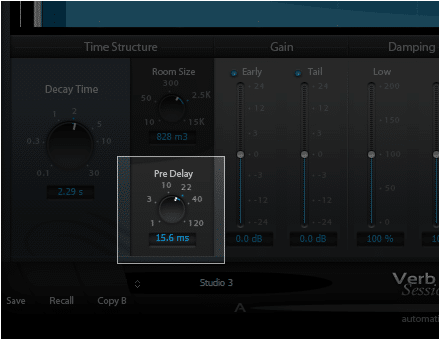 The Pre Delay controls the time at which the reverberation portion of the effect starts to be noticed, with respect to the DIRECT signal. 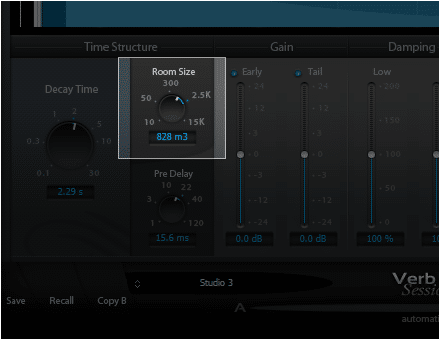 Increasing this helps to distinguish between direct and effected sound and preserve intelligibility, especially with large decay times and room sizes which would otherwise drench the audio material in reverberation. Early Gain – Controls the level of EARLY and CLUSTER contributed to the overall effect. Tail Gain – Controls the level of LATE/TAIL contributed to the overall effect. High Damping – Adjusts high frequency content damping. The Filter Section controls the characteristics of the filter applied to the signal fed to the reverberation engine, affecting the overall frequency response, if required. Low Freq – Low pass filter frequency cutoff of the corresponding filter section. 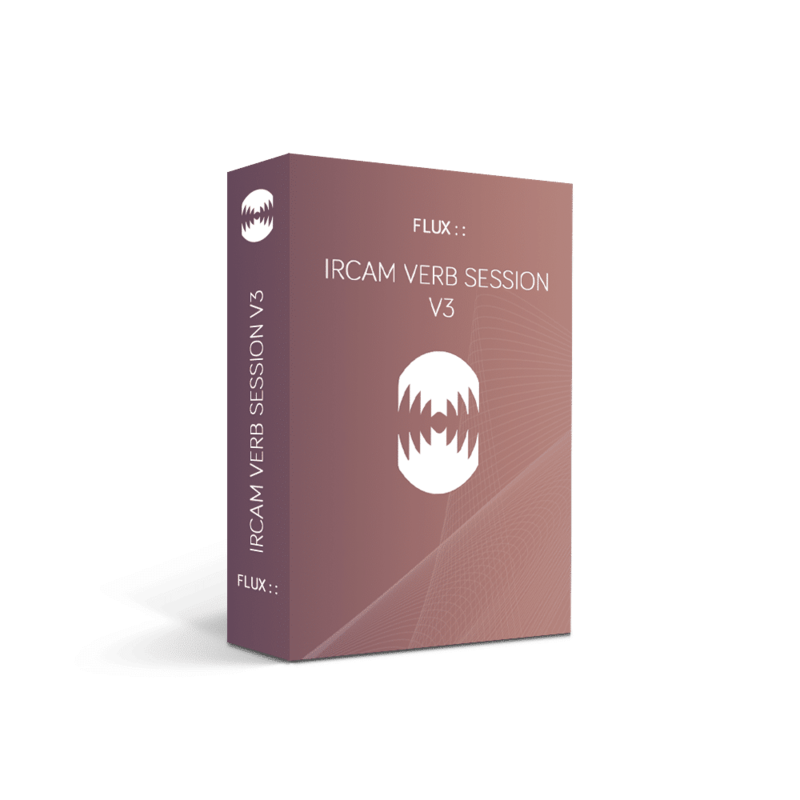 Ircam Verb v3 technology, quick and simplistic workflow to achieve great results instantly, ultimate reverb solution for seasoned demanding engineers and mixers. 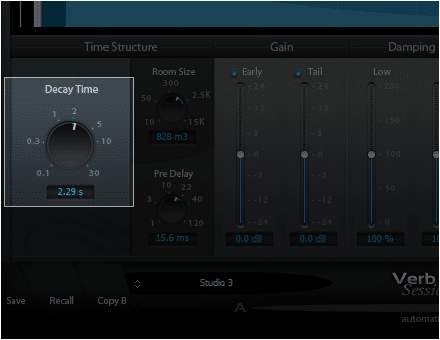 The Decay Time, is the duration of the reverberation tail in seconds, the time it takes for the reverberated sound to die out. In technical terms this is often referred to as the RT60 factor, the time at which the response of the reverberation to an input signal goes below -60dB of attenuation. The Room Size is a meta parameter used to quickly perform a homogeneous set of parameters for the early reflections part (early + cluster). These parts are particularly important to achieve the “room” feeling of the desired space. 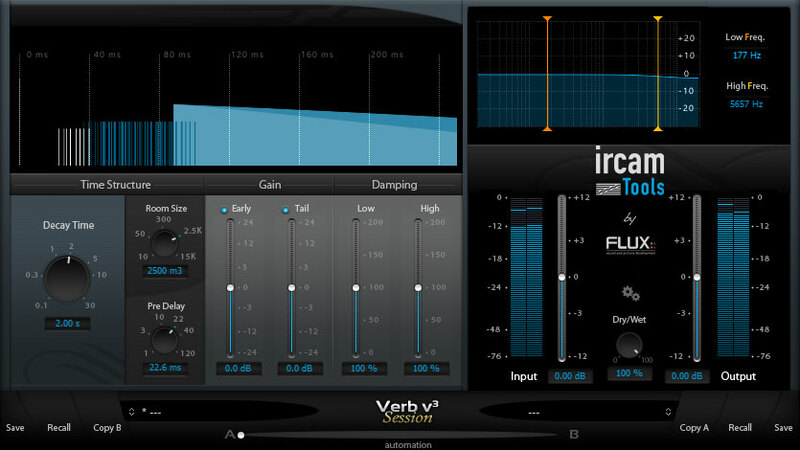 It adjust the time structure of the whole reverberation (early-min, early-max, cluster-min, cluster-max, reverb-start). Early Gain - Controls the level of EARLY and CLUSTER contributed to the overall effect. Tail Gain - Controls the level of LATE/TAIL contributed to the overall effect. High Damping - Adjusts high frequency content damping. Low Freq - Low pass filter frequency cutoff of the corresponding filter section. 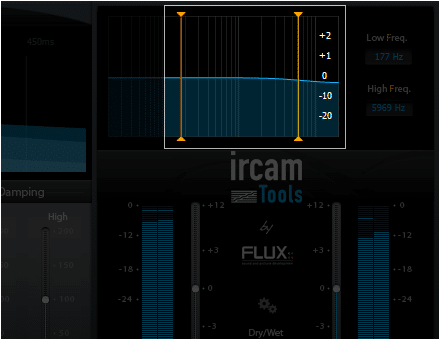 Sampling rate up to 192 kHz for native (AU/RTAS/VST/AAX AudioSuite).